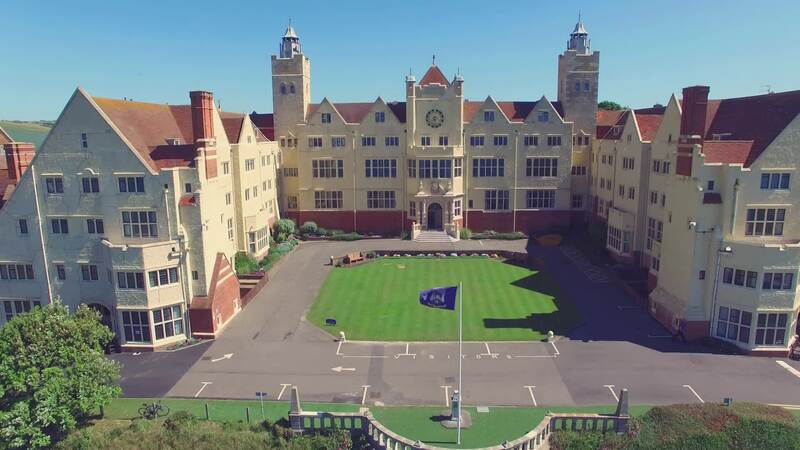 Roedean sits on a beautiful 45 acre campus, with a further 75 acres of land adjacent to the site. The school is very accessible, close enough to Brighton to take advantage of all it has to offer in terms of culture and a dynamic atmosphere, but far enough away to enjoy the beauty of our unique cliff top location, which brings together our proximity to the sea with a sense of space afforded by being on the edge of the South Downs National Park. Having our own tunnel down to the sea near the marina, and being just a few minutes from the beaches and bustle of Brighton town and its pier, our girls can walk down to the undercliffs, explore the rockpools, go shopping in Brighton, undertake charity work in the local community, learn to sail along the coast, go to the cinema in the marina at the weekend, or simply enjoy our beautiful grounds. The school offers a truly inspirational setting for girls to inhabit as they grow up, whether it’s enjoying the tranquility of the sparkling sea on a summer’s day, or marveling at its wild beauty during a winter storm. The unique experience of growing up in this idyllic coastal landscape will create lifelong memories for the girls. Gatwick is the closest airport to Roedean – from there, the journey takes about 30-35 minutes by car or by train. Heathrow is a little over an hour away by car. There are frequent train services from London – trains from Victoria take 53 minutes to Brighton. There is also a train which leaves from London Bridge. Other direct trains run along the coast to Southampton, Portsmouth and Eastbourne, or north through London to Luton. Roedean is approximately 10 minutes from Brighton station by taxi. A good local taxi service is Streamline Taxis, 01273 747474 or 01273 202020. If you are using sat nav, you should use the postcode BN2 5RJ, and drive to the very end of Roedean Way to the electric gate ahead of you. Please note that the school's actual postcode is BN2 5RQ, but this will send you to a gate which has been closed to traffic since the 1960s. Alternatively, below are some old-fashioned instructions. If you get stuck, just give us a ring on 01273 667500. Travel south on the M23 and then the A23. On the outskirts of Brighton follow signs for Lewes A27. Leave the A27 at the third junction (exit is signposted Falmer, University of Brighton and University of Sussex). Follow signs for Woodingdean (two miles) and at Woodingdean traffic lights turn right. After another mile, you will reach the racecourse traffic lights. Turn left down Wilson Avenue towards the sea. After half a mile, you will reach the fire station traffic lights at the bottom of the road. Turn left and just over the summit of the hill you will see the school in front of you. Turn left into Roedean Way and follow the road to the end to reach the school gate. Travel east on the A27 towards Lewes. Ignore the Brighton and Hove junctions and take the one signposted Falmer, University of Brighton and University of Sussex. After half a mile, you will be at the fire station traffic lights at the bottom of the road. Turn left and just over the summit of the hill you will see the school in front of you. Travel west on the A27 towards Brighton. Before reaching the city, leave the A27 at the junction signposted Falmer, University of Brighton and University of Sussex.